Version 1.0 Is Submitted to the App Store – What’s Next?! Why on earth would I do this? Loose Leaf took me over 2 years to build, and the vast majority of that development was closed off from feedback – I didn’t start showing my work until well into the 2nd year of development. If I had it to do over again, this is the biggest thing I’d change – early feedback is incredibly important. So I wanted to try something different and build an app extremely quickly: I gave myself just 2 weeks to build an app from scratch and submit it to the App Store. 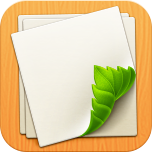 I also wanted to build the app completely in the open – a contrast to Loose Leaf’s closed process. I thought it’d be fun to have 100% of the code be open source from day 1, and to also have 100% of the code built on stream. It could be fun for viewers to participate in feature decisions, and might serve as an interesting “This is what mobile development is really like” for developers thinking about working in mobile. The stream has also brought a fair amount of attention to the project. CNN Money recently wrote about livecoding.tv – the site where I’ve streamed the development – and included some quotes and a photo from yours truly! ITWorld also wrote up an article about the project which was very fun to see. For such a short app experiment, it’s already brought in some considerable attention! When I started Loose Leaf development three years ago, I believed that the value was in the code I was writing. I’ve learned that’s very rarely the case – the real value is in the community you build around your project. During those 2 years of development, I missed the biggest opportunity, which was to build and bring a community with me during that dev process. As I continue to work on Loose Leaf, Spare Parts, Remotely, and other apps – yes, I’ll be coding – but more importantly I’ll be focused on encouraging the community around each of these apps. I’ve been so used to coding in my own silo until everything is perfect – it’s been eye opening to learn how to include others in the development process, even before anything is built, polished, or even decided. I’m going to continue work on Spare Parts, including keeping 100% of the code open source and on stream. Feel free to follow along at the YouTube channel or on Twitter. I’m also going to find ways to continue to open up Loose Leaf’s development process and keep adding to its growing open source contributions. Day 14: We Submitted to the App Store! Today marks 2 weeks since we started this project, and we were successful! We’ve submitted to the App Store!!! When I started this, I honestly wasn’t sure if it would be possible to build something with just a few hours a day in only two weeks, but we’ve done it! Sign up to be notified when it’s released! And get in touch if you’d like early beta access! Day 13: Changing Length and Gravity! Today we fixed a few user interface issues, and also added in the ability to change attributes of various parts. Sticks can now change length, points can change their gravity, and balloons and wheels can change their radius! Sign up here to be notified when we launch!